The Mesa Top trail is located in the Grand Mesa National Forest near Grand Junction, Colorado. The east end of the trail begins at the Mesa Top trailhead off of Highway 65 near the Delta/Mesa county line. 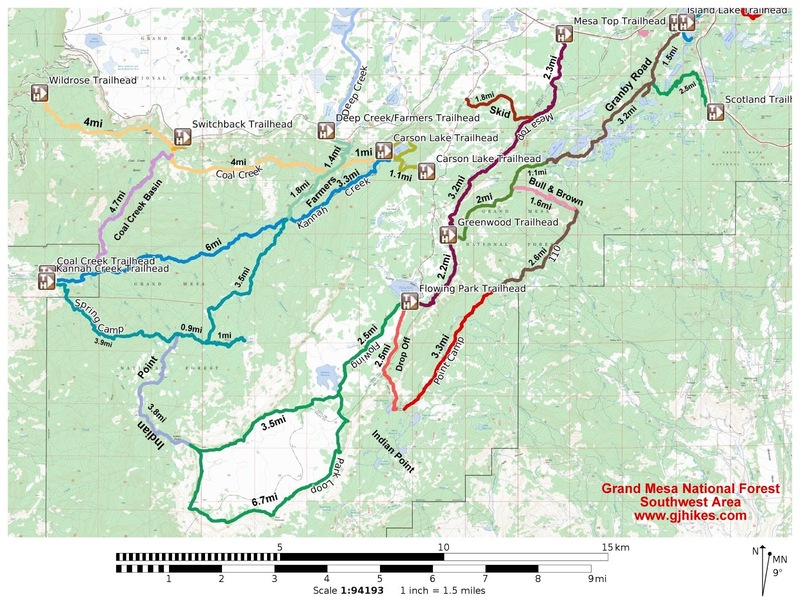 The trail travels across the mesa through the forest to the southern rim of the Grand Mesa overlooking the Granby Reservoirs. From there it follows the rim to its western end near the Flowing Park Reservoir off of Forest Road 109. 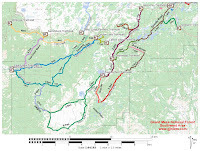 The trail can be combined with the 15 mile Flowing Park Loop for a total round trip distance of 30.4 miles. The trailhead is located just off Highway 65 between the Lands End Road and the County Line. The large parking area is normally filled in the winter months with scores of snowmobiles. There are two vault toilets along with two change rooms at the Mesa Top trailhead. The trail begins by heading south almost parallel with the highway. There are wide open meadows that seems to stretch for miles to the west towards the Carson Lake area. For the most part the trail skirts the meadows by staying just inside the trees. Around the 1 mile point the trail turns away from the meadows and heads more toward the rim of the mesa. 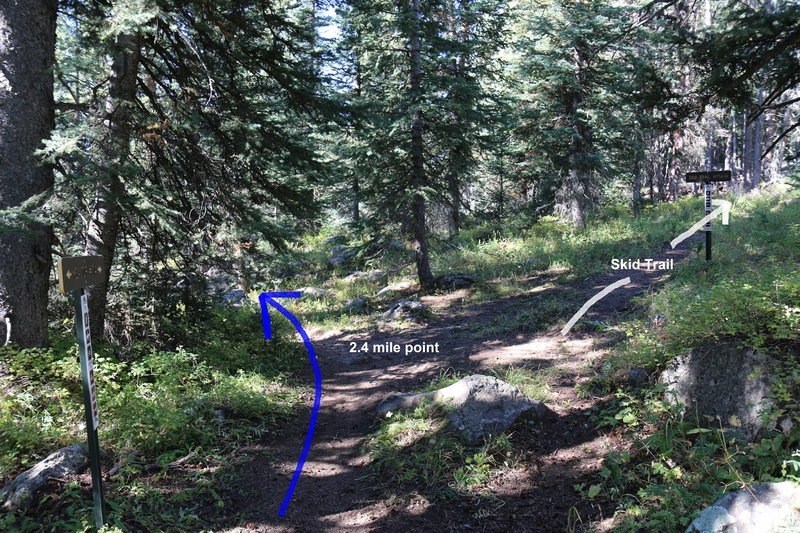 At the 2.4 mile point the Skid trail branches off on the right. When we did the trail for this post we took Forest Road 109 when we reached the other end of the trail at Flowing Park and rode it to FR 109H and returned to this point via the Skid trail so that we could post it too. Around the 3 mile point the trail reaches the rim of the mesa where there are some nice views of the Granby and Battlement Reservoirs as well as the town of Delta off in the distance. The sky was filled with smoke on this day from distant forest fires. 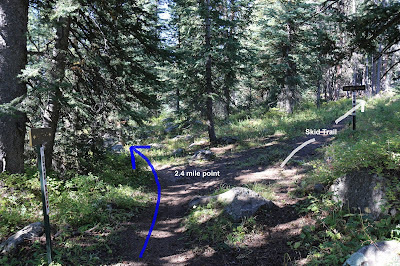 Around the 3.4 mile point the trail kisses up against Forest Road 109.2H which heads in the direction of Carson Lake. A large portion of the Mesa Top trail crosses rocky stretches of basalt of varying sizes. There are some nice runs of smooth trail that can come as a relief. The trail crosses a roll over through a pasture fence at the 3.8 mile point. This is about the halfway spot to Flowing Park. It is hard to beat the trails on the Grand Mesa for getting away from the heat of the desert trails in the valleys below. For the most part the forest is all pine and spruce trees until the trail gets closer to Flowing Park where some quacking aspens are mixed in. Near the 6 mile point the Mesa Top trail crosses Trail #721. This trail leads off the mesa toward the Granby Reservoirs with connections to all the trails and roads in that area. The roughest part of the entire trail comes up where the trail drops over a rocky outcrop. The final stretch of the trail smooths out quite a bit. The trail comes to an end at Flowing Park Reservoir. From here you can go left to the Flowing Park trail that loops around the Point Peninsula part of the Grand Mesa. You can also pick up the Drop Off trail which goes over the side of the mesa to the Palmer Reservoirs. Most hikers on the Mesa Top trail only hike out so far before turning around and heading back. The trail gets a good bit of use from horseback riders and we spoke with one guy that had been backpacking on the trail. The folks with COPMOBA, the Colorado Plateau Mountain Bike Trail Association, was the driving force behind the trails construction. If you would like to see it for yourself then all you have to do is grab your bike or 'Take a hike'.